This week has seen a return to music rehearsals for Stockhausen’s Mittwoch aus Licht with Ex Cathedra for Birmingham Opera Company, after an exciting appearance at the York Early Music Festival. The York Early Music Festival hosted John Potter and I in the first live research output of Southampton University and Mark Everest’s AHRC funded Conductus Project – Cantum pulcriorem invenire. 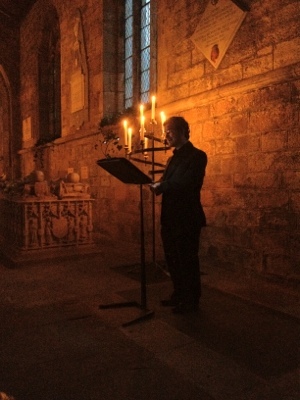 The performance took place in the beautiful All Saints’ Church on the Harewood House Estate late in the evening. The space was illuminated by candle light and the premier showing of Michael Lynch‘s beautifully evocative video. Thankfully there was enough light so as not to cause too many logistical problems when moving around the space during the performance, though John did have to use the torch app in this iPhone at one point. Singing the Conducti in this space as a whole concert performance for the first time was a phenomenal experience. It was exciting to see how elastic we could be with the free texted sections, and exploring the juxtaposition of these against the rhythmic caude. I think the space encouraged us to explore the sound we were making too, with the resonance providing a sort of polyphony, especially in the solo numbers. The audience feedback was extremely positive with many fantastic comments about Michael Lynch’s film (during which, one of the horses tried to eat my head…). People also liked the fact that we didn’t take new notes between certain numbers, and that we were not static throughout, but moved around the space. The first recording, Conductus Vol I – Music & Poetry from Medieval France is being released by Hyperion Records in September and we are scheduled to record Vol II in January next year. With both CDs worth of repertoire under our belts, we hope to be able to perform more gigs during 2013. Next week sees Stockhausen move into production rehearsals at the Argyle Works in Birmingham. The extensive music rehearsal time that we have already had for this piece has meant that we have been able to really get under its skin. Stockhausen (or his assistants) was so meticulous about his markings and it is impossible to overlook them. It will be very exciting to see Graham Vick’s vision for the piece on the stage. Unfortunately the shows are sold out, but hopefully there will be some media to show once the performances are complete.